The error code 0x800 and other similar error codes may come up when Windows operating system on your computer goes wrong or gets corrupted. This error code is not new to many users who work with computers at office or home, but few of them know how to deal with it correctly and efficiently. This article provides solutions to fix the error in different situations. Windows Defender, antispyware software, is built in Windows, aiming to protecting computer from spyware and unwanted pop-ups of other software. Windows Defender is designed to offer real time protection and monitoring for operating system, as spyware may be installed by itself on computer without informing you when computer is connected to the Internet. Besides, your computer may infect spyware when you access data with CD or USB disks. Operating system is the basic platform that you have to install on computer before carrying out other tasks. At present, there are a couple of brands of operating system for PCs and servers, and Windows is one of the most popular systems. Users are familiar with this system and its producers has released quite a few versions to improve performance and user experience. 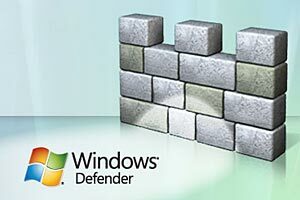 Windows Defender is a tool provided by Windows operating system and it is able to help users to safeguard computer against slow performance, spy software, pop-ups, security risk and other unwanted software. Windows system is known as its attractive features such as graphic user interface, multi-tasking, easy installation, add/remove programs, internet ready, networking support, etc. Windows XP, Vista, 7, 8 and 10 are recent widely used versions and Windows 10 is the latest one for the moment. There are a lot of advantages to Windows Defender apart from its functions mentioned in previous paragraphs. It's built in Windows and won't disturb you with pop-ups or charge fee from you. It offers pretty good protection all the time even though you keep system up-to-date and it's still capable of blocking of dangerous plugins. Besides, Windows Defender can work with almost all computers and provide solid protection. Errors are reported after computer boots to system and that will stop the Windows Defender service from working. Apart from that, in some Windows versions this error may lead to slow performance, freezing system, blue screen, installations errors, locking up software, startup issue, etc. This is a troublesome issue, because spyware may attack system as the real-time protection via efficient scanning is not available anymore. This error can't be ignored and users should be careful and take measures. In general, this error is the result of corrupted registry structures, malware, virus, incorrect configuration, incompatible system drivers, missing system files and damaged data in system and bad system maintenance. The improper configuration can result in the failure of Windows Defender when starting computer system. Besides, some third party software that runs in the background might give rise to the problem as well. Do you know how to deal with spyware when Windows Defender fails to work? If you are still at a loss to cope with the error, please learn from the article and follow the guide below to eliminate the error easily. In this section, four solutions will be given to help you solve the problem and you can choose one or two of them to fix the issue. In some cases, old system version of Windows may generate the error 0x800 and it can be fixed after you update system to the latest version. Click the Start button and hit the Control Panel. Select System and Security and then choose Windows Update. This feature can also be found by clicking "Start" button and typing "Windows Update" in the searching box. Click the option Check for updates and Windows will connect to the Internet and check for updates. Then Windows reports all important or optional updates it has found. 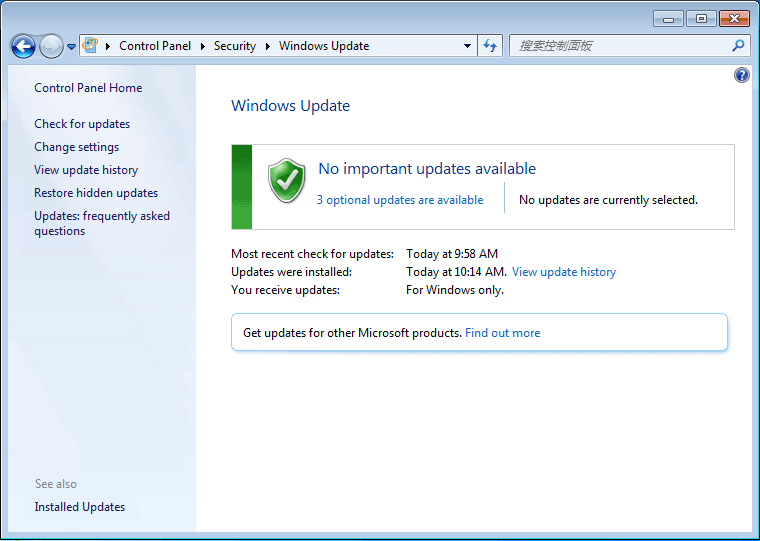 If there are updates available, you can view and select important updates to install. if you are prompted for an administrator password or confirmation, then type the password or give confirmation. Performing a sfc (system file checker) for computer can help you cope with many common computer issues such as the error 0x800. This utility provided by Windows to scan and fix corrupted files, as bad system files may cause various problem, for example unstable of your PC. Click Start button and type cmd in the searching box. 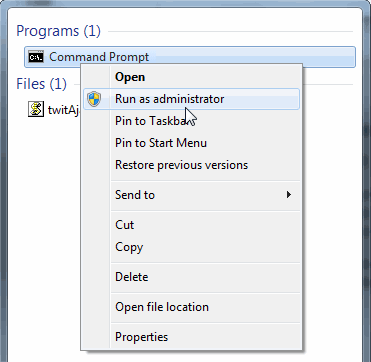 Right-click cmd and select "Run as administrator". If you are asked to enter administrator password then type the password. 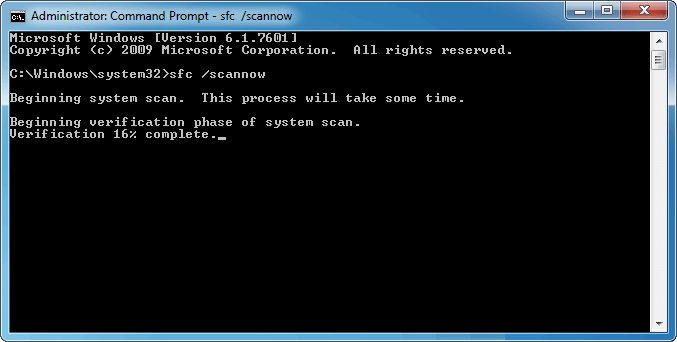 Type sfc /scannow in the command prompt and hit "Enter" key. The command will scan all protected system files and fix corrupted files with cached backup which is placed at %WinDir%\System32\dllcache. Do not close the Command Prompt Windows until the process is 100% completed. The scan result will be listed when it is done. Method three: Check driver issues. 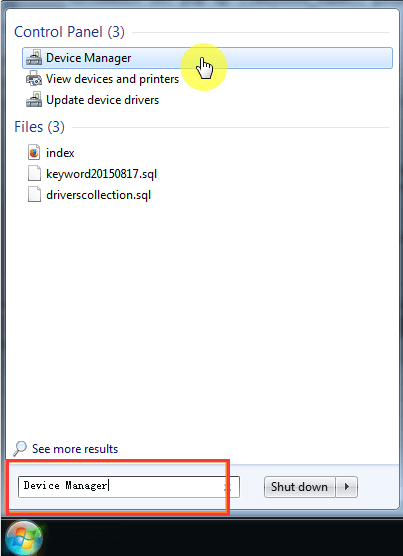 Click Start button and type Device Manager in the searching box. Then right-click Device Manager and run as administrator. Navigate through the listed devices and check if there are outdated drivers. 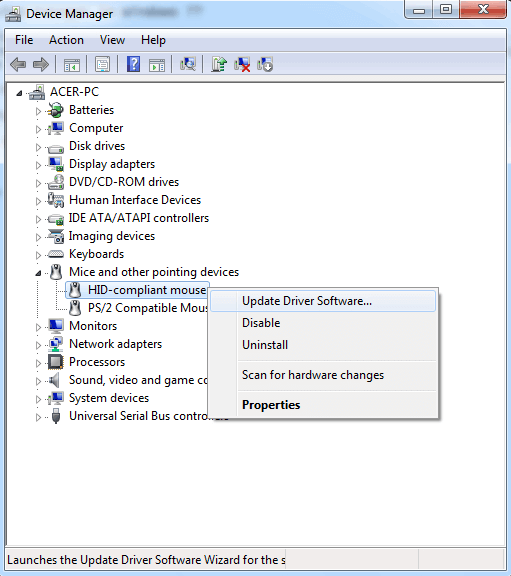 Right click hardware's name that you want to update drives and click "Update Drivers Software" to get update wizard. Then follow prompts of the wizard to update drivers. Doing a system restore is a wise and efficient move to fix Windows Defender error 0x800. Thus it's important to keep system backup in case of any system problem. 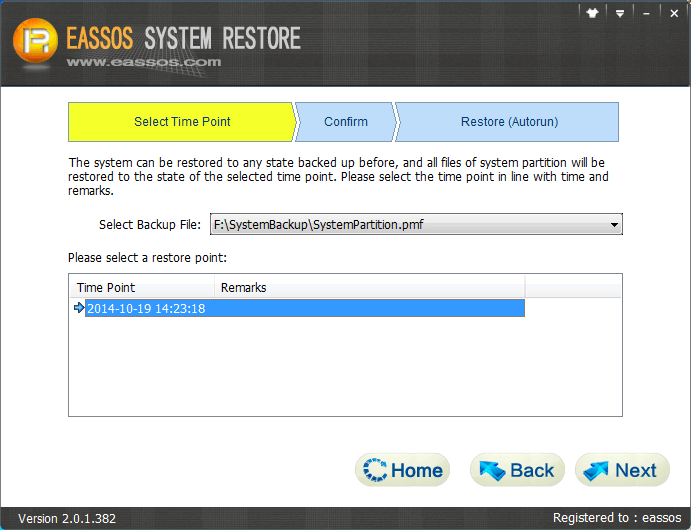 Here are detailed steps to restore system with Eassos System Restore. Install and run Eassos System Restore. Then click "Restore" button or just press F8. Select backup files and time point you want to restore and click "Next". Then the software starts system restore process. Eassos System Restore is able to backup system as easy as the restore process and it provides free trial version for users to test its features. It supports backup and restore all popular versions of Windows and supports efi-based computers. Millions of people use computer that installs Windows to complete various tasks and it'll be quite annoying to be unable to install important updates for PCs and get Windows update error 0x800. 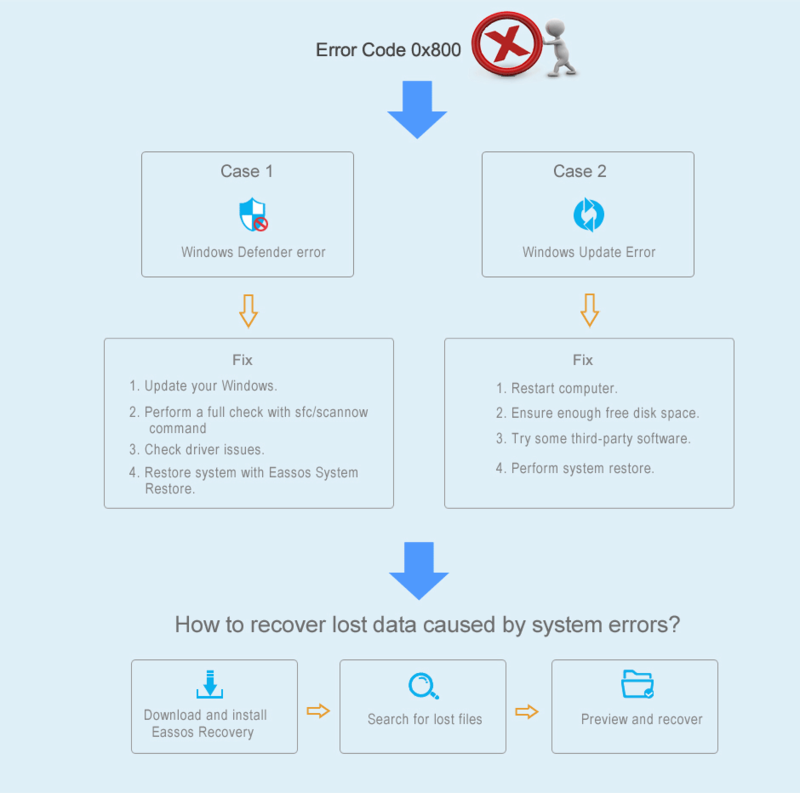 The Windows update error 0x800 is the hexadecimal way of indicating issues and it is one common format adopted by system and programs to identify errors. This error can be the result of Windows system files damage or corruption, because damaged system file entries are potential threat to the well performance of computer system. There are quantity of causes that may lead to system files errors, for instance, the incomplete installation or uninstallation of software and plugins, deletion of important system files, incorrect remove of programs and hardware. Moreover, the error also appears if computer is attacked by virus or malware/spyware or computer is shut down in an improper way such as sudden power failure. All activities mentioned above may bring about the issue that entries of Windows system files get deletion or corruption. Furtherly, corrupted system files will give rise to the missing and wrongly linked information and files that are needed to ensure the well being of operating system and applications. 1. Restart computer. Many issues like memory errors can be solved by merely restating computer. Thus, you may as well try this simple way to see whether it works out. 2. Ensure enough free disk space. It needs certain free disk space to download and install Windows updates. If system partition is running out of space, then updates will be prevented due to inadequate disk space. You can resize system partition by moving free space from other partition to C drive. 3. Try some third-party software to fix the error. There are lots of programs on the Internet and some are able to fix the error. 4. Perform system restore. If your system has been backed up, system restore is actually the most effective solution to the problem. After restoring system to a previous status, problem will be easily solved. For those who do not keep a system backup will have to consider reinstalling operating system. 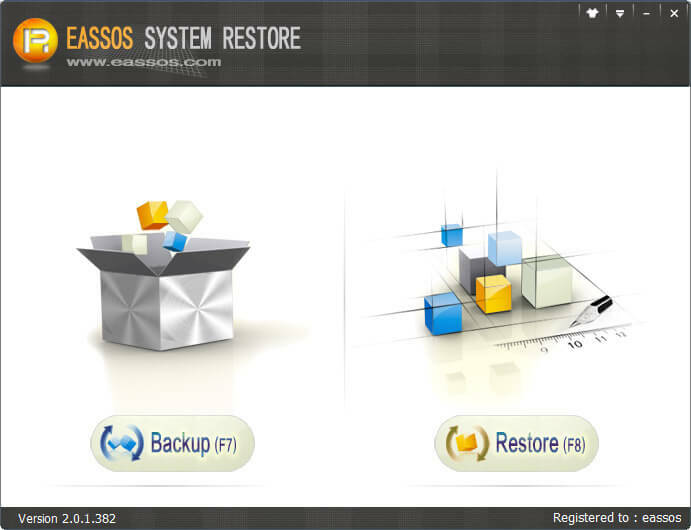 You can restore system with Eassos System Restore following steps in the previous part, which is easy and time-saving. In addition, Windows provides system backup and restore function: first, turn on computer and boot to system, and then click Start button, All Programs, Accessories, System Tools and System Restore. Second, choose "Restore my computer to an earlier time" on the pop-up window and click "Next". Third, choose one time point you want to restore and click "Next" and start the restoring process. Last, when the restoring process finishes, please restart computer. System errors means operating system is no longer in good state and contains misconfigured programs, corrupted system file entries, etc. All these are threatens to data security, as partition may become corrupted and inaccessible. Thus data loss is another potential problem you should consider. Besides, files also can get lost due to human errors such as accidental deletion of significate files and formatting wrong drive. Data loss is no longer a rarely happened issue and it is getting more concern from all users who depend on computer to work. Therefore, it's necessary for all users to know and learn how to recover lost data. 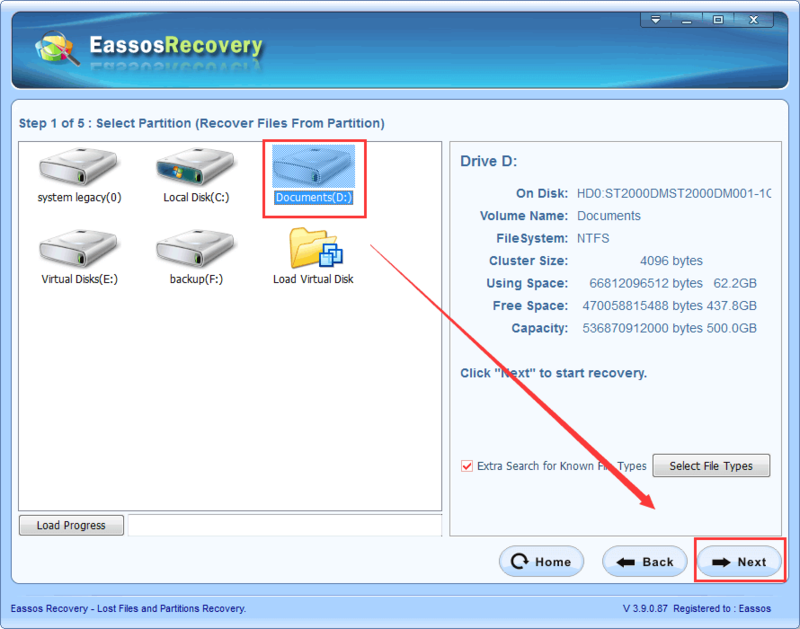 Eassos free hard drive recovery software – Eassos Recovery Free can help you get back lost files and partitions in many cases. 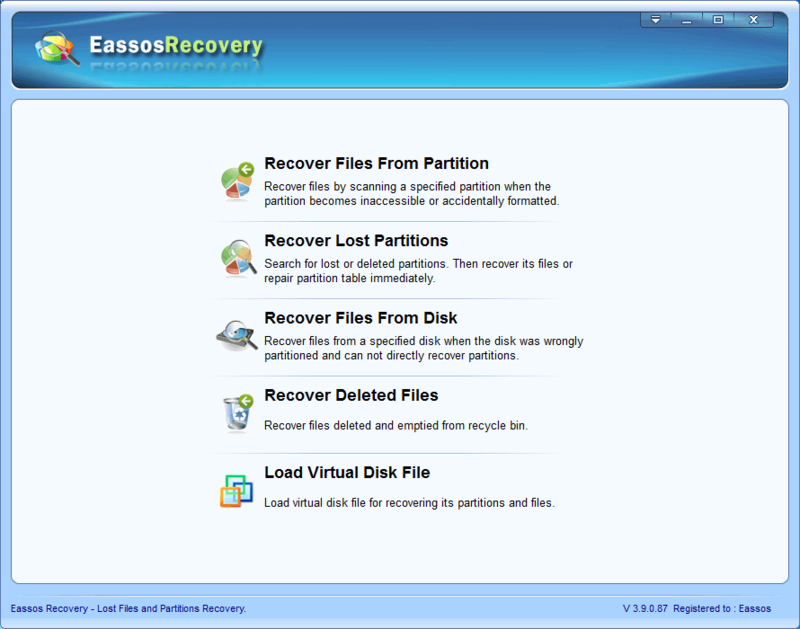 Launch Eassos Recovery Free and select recovery module based on data loss situation. 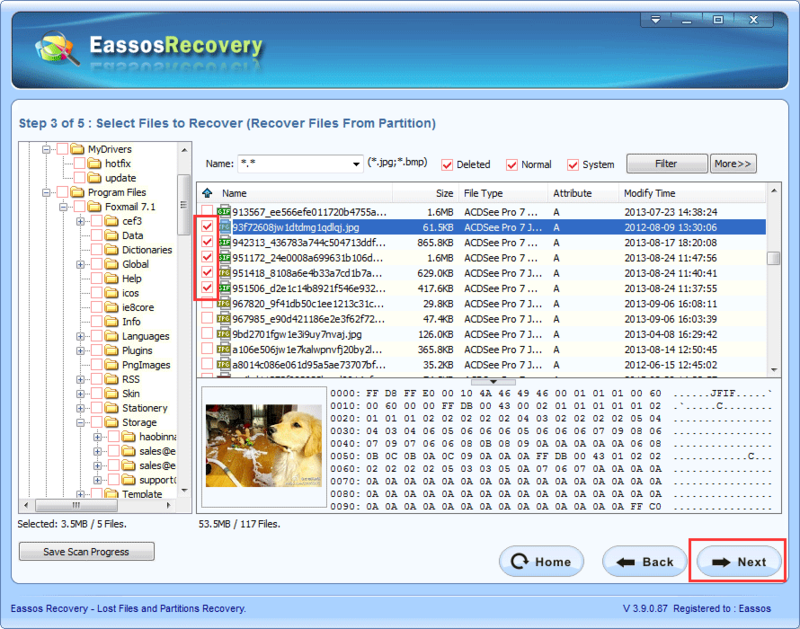 Note that, the recovery tool shouldn't be installed in the partition that suffers from file loss; otherwise lost date might be overwritten and can never be recovered. Select partition or disk where lost files were located and click "Next" to start data searching. Preview and save files. Lost files will be listed gradually while the scanning is in progress and you can preview files and save desired files to a specified location.